Arizona Native Status: Introduced. This naturalized weed is native to southwestern Europe, the Mediterranean region, and eastward to India. 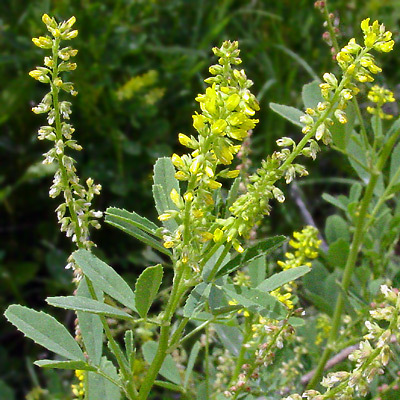 Description: The small flowers are in narrow, elongated racemes. The individual flowers are pea-like and only 3 mm long. The leaves are green, alternate, and have 3 sharply-toothed, oblanceolate leaflets with blunt or indented tips. 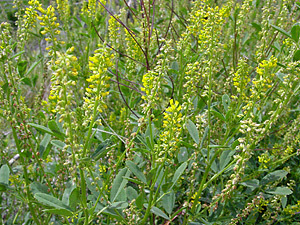 The similar Yellow Sweetclover (Melilotus officinalis) has point-tipped leaflets and larger flowers that are usually twice as long.